This game has been discontinued and replaced. 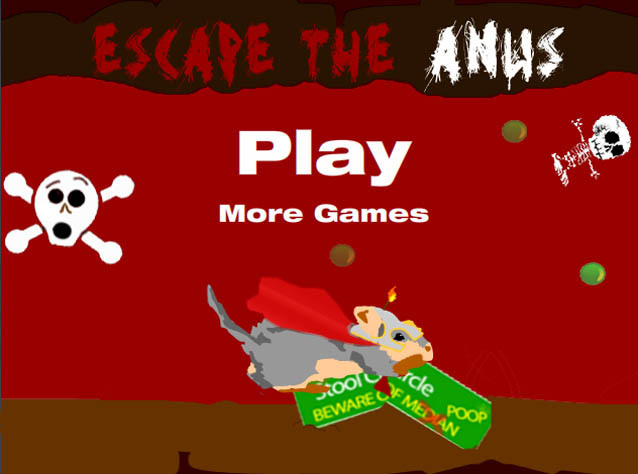 We have rebuilt this game with the newest version of Flash Actionscript, have redone the movement code, added savepoints and more. Please go to Lemmiwinks Great Escape for the new game. Directions: Use the arrows or W, A, S, D keys on your keyboard to move. Press P to pause the game or run over a help blip to bring up this page. You can run over the blips for power ups. Power ups can be good or bad. To undo all negative power ups, run over the “Reset” blips. Avoid hitting the walls and objects else you will have to restart the level without your power ups. Run over the finish line to get to the next level. Game Description: You are Lemmiwinks, the class Gerbil at South Park Elementary School. Because of Mr. Garrison, you have been “injected” into his companion, Mr. Slave. Where were you injected? I think that is quite obvious. Now you must escape. Good luck Lemmiwinks. Reset – Undoes all power ups but the helmet. Reverse Arrows – Temporarily inverts your controls. For example: the left key makes you go right. This entry was posted	on Monday, April 4th, 2011 at 6:43 PM	and is filed under . You can follow any responses to this entry through the RSS 2.0 feed. You can leave a response, or trackback from your own site.